Each 5 milliliters of Adequan® i.m. contains 500 mg of Polysulfated Glycosaminoglycan and Water for Injection q.s. Sodium Hydroxide and/or Hydrochloric Acid added when necessary to adjust pH. Sodium Chloride may be added to adjust tonicity. Polysulfated Glycosaminoglycan is chemically similar to the glycosaminoglycans in articular cartilage matrix. PSGAG is a potent proteolytic enzyme inhibitor and diminishes or reverses the pathologic processes of traumatic or degenerative joint disease which result in a net loss of cartilage matrix components. PSGAG improves joint function by reducing synovial fluid protein levels and increasing synovial fluid hyaluronic acid concentration in traumatized equine carpal and hock joints. The recommended dose of Adequan® i.m. in horses is 500 mg every 4 days for 28 days intramuscularly. The injection site must be thoroughly cleansed prior to injection. Do not mix Adequan® i.m. with other drugs or solvents. Do not use in horses intended for human consumption. Not for use in humans. Keep this and all medications out of the reach of children. 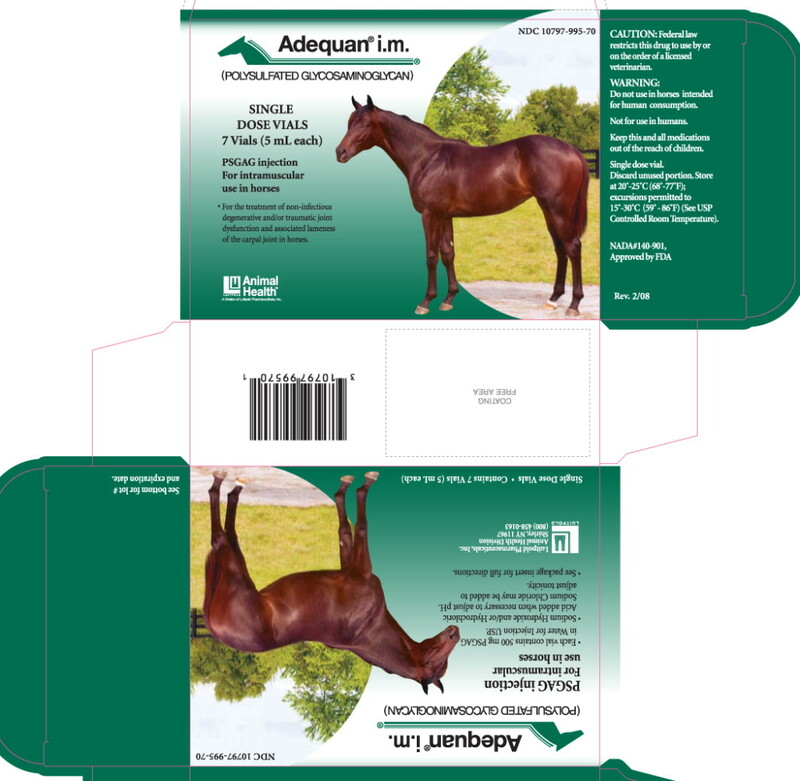 The safe use of Adequan® i.m. in horses used for breeding purposes, during pregnancy, or in lactating mares has not been evaluated. Toxicity studies were conducted in horses. Doses as high as 2,500 mg were administered intramuscularly to 6 horses twice a week for 12 weeks. This dosage is 5 times the recommended dosage and 3 times the recommended therapeutic regimen. Clinical observations revealed no soreness or swelling at the injection site or in the affected joint. No animal had any clinical or laboratory evidence of toxicity. Store at 20°-25°C (68°-77°F); excursions permitted to 15°-30°C (59°-86°F) (See USP Controlled Room Temperature). Discard unused portion. Dispose of spent needles in accordance with all federal, state and local environmental laws. Adequan® i.m. solution, 500 mg/5 mL is available in 5 mL glass vials, packaged in boxes of 7.